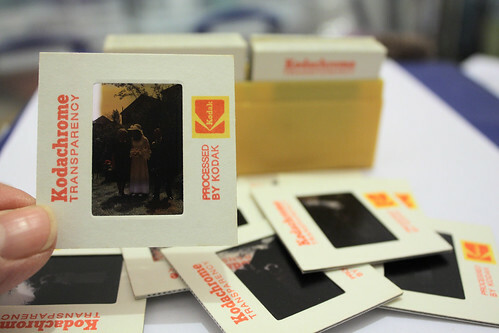 These old Kodak colour slides from the mid-70s certainly bring back memories. I really must have another go at scanning them. I have done a load of them, but wasn't all that satisfied with the quality. Since then I have bought another scanner, but haven't even got it out of the box. I still have a bunch of undigitized slides, but I don't think I'll even bother scanning them. I even threw out my once precious hoard of Velvia without a thought when I discovered it in a cupboard. It's amazing how much digital technology has advanced since then. I'm not scanning most of mine either. All the ones that meant so much to me when I took them, the memories of summer holidays in nice places and pretty scenery, are being discarded. I could go and re-take those shots now. No, it's often the ones that were just taken for the sake of using up the roll of film that are so precious to me now, pictures of people, pets and places that are no longer with us. I still haven't finished scanning the last box (Meccano models, planes, cranes, trains, and the occasional automobile) of my Dad's slides, but I'm down to the last few dozen. We left that box until last as being less interesting to my mother and myself than the flowers, trees, landscapes and family photos, but I find them oddly poignant, which is another reason for not just pushing through and finishing the lot. I just had a chat today with a friend on skype about slide scanners. I have about 200 or more slides esp from my younger childhood. My grandfather used to make slides between 1965-1973 (than he switched to super8 films). We have an adapter which we can use on our Digital Canons but the quality is not very good and you just can do one picture. I have seen scanner where You can use the magazins they are stored in. But those are extreme expensive.